Lord God, we thank you for the gift of your word in scripture; as we contemplate the meaning of the gospel for this day may your spirit open our hearts and our minds to those messages you would have us hear. Amen. This scripture wasn’t in our reading today but I wanted to share it as it includes the recorded words of Christ just before he calls the twelve and sends them out. I want you all to take a minute to contemplate the words of this short passage of scripture…do the conditions mentioned feel familiar? As I contemplated the gospel reading for today and read further to discover this passage it came to my mind that Christ could have very well been speaking to us. We live in a day where the world is calling out for the transforming truth and love of Christ to heal its wounds. However, when I survey the world around me I see such confusion and turmoil, not only in the secular world but within the Christian world as well. Christendom, which had such a promising beginning, filled with truth loving communities bound together under the leadership of the Apostles and their successors the Bishops, now finds itself in a fractured state. Instead of standing together in faith and love the so called “shepherds” of much of the Christian world stand in opposition to each other having shed much of that faith once delivered to the Saints and preserved by our Holy Mother the Church Catholic. In such a condition is it any wonder that there is a rising secularism in the Western World that rejects all things of faith, not only Christianity, but faith in general? What is it that we, can do? Should those of you “in the pews” do anything at all or does this duty rest on those of us called to the ministry? Let me tell you that each and every one of us are called to be one of the workers in the Vineyard. When we passed through the waters of baptism becoming joined with Christ in his magnificent family, we committed not only to follow His teachings but to hold them in our hearts and be every ready to share them with those around us. In today’s gospel reading we see this message writ large in the mission call to the Apostles. They were called by Christ to go out and preach to the community. They were called to teach, to convert, and to heal those who were receptive of the message of Christ. Well let me tell you that each and every one of you stand ready right now to go into the vineyard and teach the word of God and heal a broken world. No special training is needed, no awesome spiritual insight, or perfect nature is necessary. Instead all you need to do is walk your life hand in hand with Christ and be a visible beacon of what it means to be a Christian. In my secular life I’m a school teacher, and while I have never used that platform as a means of “conversion” or “preaching” at my colleagues and students they are all acutely aware that I am Fr. Brenden and what that means. When issues arise I’m not afraid to let my “Christian flag fly”. When teaching my science classes I happily dispel misconceptions students have around Christian belief and open their minds to the idea that faith and science are not mutually exclusive. Often this is not done in an overt way by simply by showing that a person of faith can also be a person of reason and science. In the staffroom questions of morality and belief often come up around the lunch table and when they do my voice is always ready to share what the truths of the gospel are and the moral insight of Christ and His Message. It is in these simple things that the Christian faith and love of Christ are spread; from these simple instances of sharing what it is to be a Christian (without being “preachy”) comes great change in people’s lives. These conversations and opportunities plant the seeds of hope and faith within hearts. 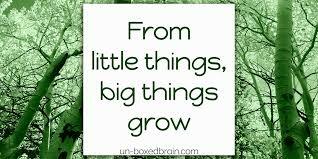 After all, in the words immortalised by Australian singer/songwriter Paul Kelly “from little things big things grow”. While each and every one of us could be called to literally walk forward into the world and preach the gospel in a radical way, I believe that it is through these small almost invisible acts of “faith sharing” that the transformative love of God will spread the light and love of Christ inti the world in real and tangible ways. So, I want to challenge each and every one of us to leave this place invigorated in our faith and prepared to share the Christian faith that lay inside of us. Boldly walk forward in the world and be an example in thought, word, and action and help heal a broken humanity. O Lord, grant to us the insight that we may know and understand those things that we have been called to do. Walking in the light of your Spirit may we also have the grace and power to faithfully accomplish your will in all things; grant us the courage to always stand as examples of your love and truth. Through Jesus Christ our Lord, who lives and reigns with you and the Holy Spirit, one God, now and for ever. Amen.